Home » LaRouche: "Hillary is the Enemy, the Enemy of the American People"
LaRouche: "Hillary is the Enemy, the Enemy of the American People"
President Barack Obama and Secretary Hillary Clinton at the funeral of Ambassador Chris Stevens, September 14, 2012. 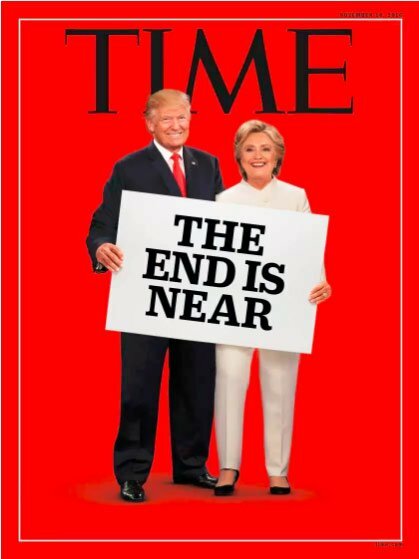 With only a few hours remaining before the Presidential election in the United States, the cover of the current Time Magazine captures the mood in the country about the election process: Hillary and Trump are shown holding a sign reading "The End Is Near." November 14, 2016 cover image of Time magazine. But all things are not equal in this election. Nearly everyone is trying to figure out who is the lesser of two evils, as the press harps on the "totally divided nation." But Lyndon LaRouche has made clear in the past weeks that the nation is in fact not divided — there is near unanimity in the hatred of Wall Street; the demand for Glass Steagall to crush the "too-big-to-fail" speculative monsters on Wall Street; hatred of the perpetual wars we have fought under Bush and Obama; hatred of the open planning for a nuclear confrontation with Russia and China; hatred for the disintegration of the US productive economy and the nation's infrastructure; hatred for the drug epidemic which has torn families apart and destroyed the lives of millions of Americans, even while Obama preaches drug legalization; and, most of all, hatred for Obama. What is missing is a positive vision of what America can be, for itself and for the world. It is this gap in people's vision which the program presented by LaRouche, his Four Laws, is designed to fill, to restore optimism to a demoralized nation. And there are signs across the country that this concept is awakening the American people to this great task, at a great moment in history. The majority of the American people want Glass Steagall; the leaders of industry want access to credit, to produce and to create jobs; the scientific leaders of the nation are prepared to restore American leadership in space, in fusion power development, and to teach a new generation of scientists. This is the inspiration the nation needs to rise above the degenerate political leadership and degenerate culture which has descended upon the country, and to restore the Hamiltonian policies which made this a great nation. We can, and must, restore that role today. With truly great leaders now running Russia and China, who are already building the rest of the world through win-win cooperation in science and development, the U.S. simply needs to join this new paradigm, and drive it forward, rather than threatening to blow it up. Any effort to achieve this revolutionary shift in America must begin with the defeat of Barack Obama and his clone (or worse), Hillary Clinton. Even today, NATO chief Jens Stoltenberg announced that 300,000 troops in Europe are to be placed on "high alert" to prepare for a war with Russia, while Hillary continues to rant that Russia and the KGB are threatening the western world, and are the cause of her potential loss in the presidential race. Even the Green candidate for President, Jill Stein, who opposes Trump on nearly everything, agrees with him that Hillary's announced plans for no-fly-zones in Syria "amounts to a declaration of war against Russia," and warned citizens that "in this election, we are not only deciding what kind of world we will have, but whether we will have a world or not going forward." This is, of course, the warning that Lyndon LaRouche has been making since the systemic and escalating takeover of government policy by London and Wall Street following the assassination of John Kennedy.